TriMet’s next major track project to improve MAX service, increase reliability and help keep trains running on-time is a month away. 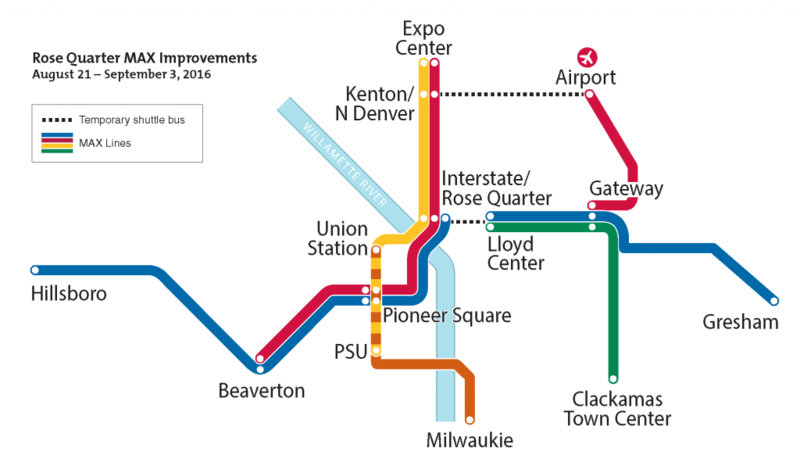 The Rose Quarter MAX Improvements project will disrupt MAX Blue, Green and Red lines and reduce frequency throughout the system from start of service Sunday, Aug. 21 through end of service, Saturday, Sept. 3, 2016. With August monthly passes on sale today, July 20, we’re advising riders to plan ahead before making a purchase. Trains will come less frequently and space on board will be extremely limited during commuting hours. Riders unable to adjust their trips may want to get books of tickets instead. The service adjustments during the Rose Quarter work will have a greater impact than the 1st Avenue project because of the location of the disruption and the need for riders to use shuttle buses rather than an easy walk. Crews will improve switches, track bed and the alignment just east of the Rose Quarter MAX Station. Riders have relied on MAX since Sept. 5, 1986 to get to jobs, school, community services and recreation. As part of TriMet’s agency-wide efforts to make our transit better and improve MAX on-time performance safely, crews are tackling major replacements and upgrades necessary for any light rail system of such age. In spring 2016, we completed three major improvements along 1st Avenue in Portland City Center. Crews replaced switches (sections of track that allow trains to move from one set of tracks to another) on 1st Avenue near SW Morrison and NW Couch. They pulled out old wooden ties and other materials and replaced them with more robust, longer-lasting materials. They also replaced curved rail near the Skidmore Fountain, among other work. 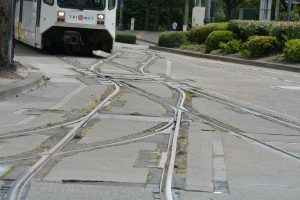 With the Rose Quarter MAX Improvements project, crews will replace switches and improve the track bed east of the Rose Quarter. Rails into the old trolley barn, next to the Rose Quarter MAX Station, will be removed and crews will re-align the rails running into the station. That will reduce the curve into the northern platform. Crews also will upgrade the signal system servicing the transit center. View an animated video of the service adjustments during the Rose Quarter MAX Improvements at trimet.org/rosequarter. During the Rose Quarter MAX Improvements, there will be no service into the Rose Quarter MAX Station. It, along with two other stations in the Lloyd District, will be closed. MAX Blue and Red lines will cross over the Steel Bridge from the west side and serve the Interstate/Rose Quarter Station, with Red Line trains continuing on to Expo Center, serving Yellow Line stations in North Portland. Shuttle buses will take riders between Interstate/Rose Quarter and Lloyd Center/NE 11th Ave Station, serving stops near the closed stations. The shuttles will run about every five minutes. With tourism and Port of Portland employment a vital part of the local economy, a direct shuttle bus will connect between the Red Line at Kenton/N Denver Ave Station and the airport, using Columbia Boulevard. We ask travelers, Port workers and members of the public for their patience and understanding as we work to provide the most reliable shuttle service that will be more consistent throughout the day. MAX Green Line will run between Clackamas Town Center and Lloyd Center, and will not run in downtown Portland. MAX Orange and Yellow lines will run on their regular routes. A few single-car trains will be added in downtown, circling the Transit Mall on 5th and 6th avenues to increase capacity. All MAX lines will run less frequently with fewer trains on the system. Expect extremely crowded trains during commuting hours. Not everyone may be able to board the first train that arrives, especially on the west side between Hillsboro and Beaverton where trains are often full during rush hours. While our maintenance-of-way crews do the majority of work on the MAX system during non-service hours or without affecting service, such complex projects like the 1st Avenue and Rose Quarter projects cannot be done in the few hours MAX doesn’t run. During the two-week project, consider altering trips to avoid main commuting hours. Go by TriMet bus or the Portland Streetcar. Telecommute, carpool, bike or use other transportation. Plan extra time for trips. Most riders should plan at least an extra 30-45 minutes for their trips, especially those traveling through the Lloyd District or to the airport from the west side. With MAX lines disrupted and frequency reduced systemwide, trains will run on special schedules. TriMet’s Trip Planner will adjust to show the adjusted schedules, shuttle bus connections and trip times. Get more information at trimet.org/rosequarter or call TriMet Customer Service at 503-238-RIDE. Room for bikes onboard MAX will be very limited due to crowding. To prevent extended delay cycle the entire way, park your bike at a station or leave your bike at home during these two weeks. It also may be the perfect time to try BIKETOWN, Portland’s new bike-sharing program.